Popcorn is good for you. Avoid the ubiquitous bad toppings and you have a nutritious, delicious, whole grain snack that is high in fiber and low in fat and calories. Why not snack guilt free and indulge in delicious toppings like herbs, spices, garlic powder, nutritional yeast, and sea salt? Some favorite spice blends of mine include curry, harissa, and pumpkin pie. I have a friend who spent time in Ecuador and became hooked on popcorn with chile powder and squirts of fresh lime. Experiment with coconut oil or olive oil in place of traditional vegetable oils. Of course, I’m also a traditionalist and I have my moments when only melted butter and salt will do. 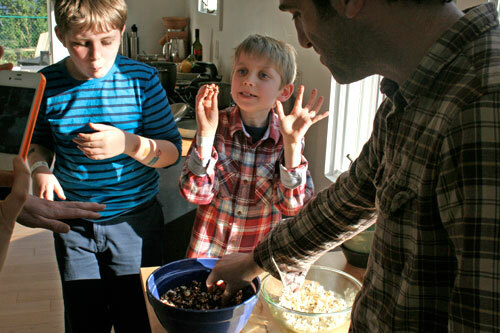 Recently, my good friends Gwilym and Brynmor helped me make a batch of popcorn with sea salt and drizzled dark chocolate. 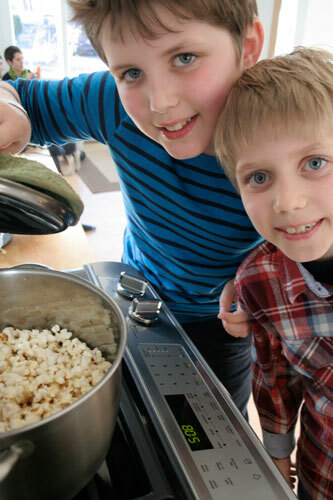 This was their first time shelling popcorn but as you see from the photos they are naturals. 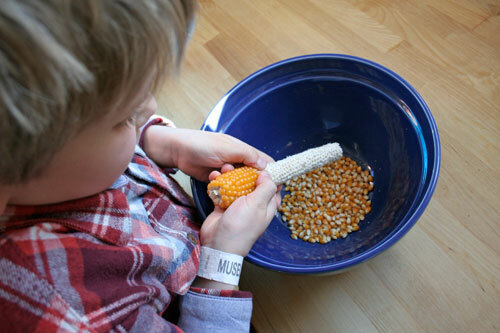 Using a bowl with high sides, point the cob down into the bowl and push the kernels off with your thumbs. Start at the bottom and work your way up and around the cob until all the kernels are removed. The cobs make great compost. Place the chocolate in a small bowl over low heat and stir continuously until melted. Meanwhile, in a medium sized pot heat 2-3 tablespoons of oil over medium heat. Place three kernels in the oil and wait for them to pop. Once popped, add the remaining kernels, cover and shake in small circular motions until you hear the popping slow to two or three every few seconds. Remove from heat, carefully remove the lid allowing the steam to escape away from you, and pour the popcorn into a large bowl. 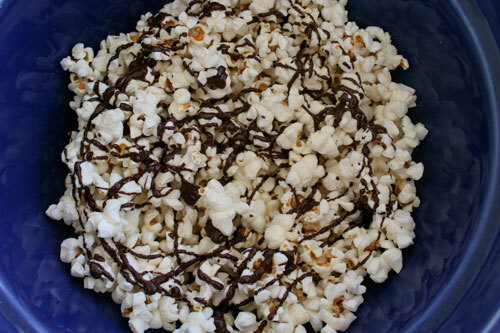 Sprinkle with sea salt and drizzle with the melted dark chocolate. Enjoy! p.s. For more ideas check out the great Amanda Blake-Soule of soulemama who’s blogging a year of popcorn, one recipe a month for one year. Including this one for Maple Pecan Popcorn.